Situated in Los Angeles, California USA, The Los Angeles County Museum of Art (LACMA) Art Museum holds a distinguished collection of Asian, Islamic, medieval, Latin American, European, and modern art. In 2015, LACMA implemented an art exhibition of James Turrell’s experiential light works. The ‘Breathing Light’ or ‘Ganzfeld’ exhibition is a thought provoking and atmospheric exhibition, and in order to create a calm, contemplative and spacious atmosphere only eight visitors are allowed inside the exhibition every 10 minutes. With these time constraints, and predicted popularity of the exhibition, LACMA was concerned about the possibility of very long, mundane and uninspiring queues. 1. An iPad kiosk was placed by the LACMA ticket office and customers wanting to visit the exhibition were invited to enter their name and mobile number to join a virtual queue. 2. 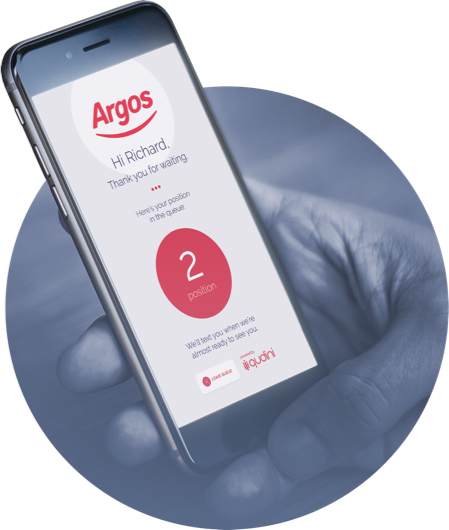 Customers received a confirmation SMS with their estimated exhibition entry time, as well as an interactive live countdown link. This changed to several bright colours to match the theme of the ‘Breathing Light’ exhibition. 3. Just before the customer’s entrance time they received an SMS telling them to go to the entrance and provide their name to a member of staff with a tablet.